You are at:Home»Reviews»Earphones»Dunu Falcon-C Review – Precision & Punch! Dunu Falcon-C Review – Precision & Punch! The Falcon-C is an excellent earphone for those wanting outstanding technical ability and a clean, spacious presentation. If you’re a fan of hybrids or really in-ears in general, you’ve probably come across one of Dunu’s IEMs. They were among the very first to assume a hybrid driver setup after the original AKG K3003 and also one of the most successful, their DK-X line-up becoming immensely sought after. Their most recent hybrid earphone, the DK-3001, garnered no shortage of acclaim on account of its engaging sound and excellent detail retrieval. However, though sonically brilliant, that model did irk with its sharp design that produced comfort issues for the majority. Hot on its tail comes the Falcon-C, a $200 USD single dynamic driver in-ear that Dunu have the audacity to call its flagship. It features liquid metal housings, a smooth design that promises vastly improved ergonomics and a tuning that is transparent and clean. I had the opportunity to get a sneak peek at Portafes earlier this year and walked away very impressed. If I like a product too much, I give it some additional time for thought; to let my ears adjust to other IEMs and ensure my judgement is unclouded by the initial hype of a new product. Of course, it is not for everyone given the subjective and deeply personal nature of this hobby, however, despite spending almost 6 months with the Falcon-C that excitement still hasn’t died down. This is a terrific in-ear at a steal! You can read more about the Falcon-C here and purchase one for yourself here. I would like to thank Dunu very much for their quick communication and for providing me with the Falcon-C for the purpose of review. All words are my own and there is no monetary incentive for a positive review. Despite receiving the earphones free of cost, I will attempt to be as objective as possible in my evaluation. The Falcon-C comes packaged within a silver box that foreshadows the metallic goodies inside. Removing the outer sleeve reveals a textured hard box with magnetic latch. Inside are the earphones within foam in addition to the aluminium carry case. It’s a very practical case, well-sized and very protective. The case contains the other accessories, 3 pairs of transparent tips with a brighter sound, 3 pairs of more balanced blue bored tips and 6 pairs of Spinfits in assorted sizes, I find them to provide a more vivid sound. In addition, Dunu provides ¼” and aeroplane adapters and the stock cable comes with a removable Velcro strap attached. 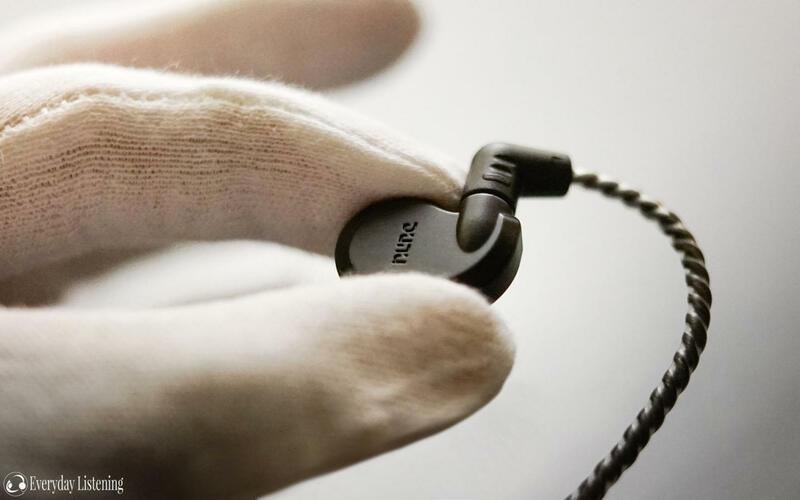 The Falcon-C is a unique looking earphone with a sleek design realised through a tough zirconium alloy. Its liquid metal housings are similar to Campfire’s dynamic driver in-ears, boasting a super smooth satin finish and smoothly formed edges that don’t wear on the ear. It has a 3-piece construction with small, well-matched seams, upholding a high level of finish overall. The earphones are well-weighted, providing confident solidity in the hand while avoiding cumbersome feel in the ear. Perhaps most importantly, the Falcon-C’s very rounded design effectively alleviates the comfort issues of Dunu’s last earphone, the DK-3001. The Falcon-C is rather very comfortable long-term, its fairly compact housings minimising ear contact and therefore hotspot formation. This is also achieved via angled protruding nozzles that promote a deeper fit than the DK-3001 while permitting the bulk of the housings to hover in the outer ear. With its well-angled nozzle, deeper fit and over-ear design, the Falcon-C achieves a very stable fit that doesn’t waver during commute, even active use. That said, due to prominent vents, the Falcon-C doesn’t isolate as well as fully-sealed earphones like the Campfire Audio Comet. As the vents are on the inner face of the earphones, they still isolate more than most dynamic/hybrid in-ears, providing adequate attenuation for public transport. They also isolate more than Dunu’s past DK and Titan series, however, they still aren’t ideal for air travel. Dunu includes a nice removable MMCX cable from factory. It’s a 4-core braided silver-plated copper unit that’s a touch springy and has a terribly tacky texture, however, it partially redeems itself with its excellent build quality. Most notable is its great strain relief and beefy case-friendly right-angle plug. Another noteworthy feature of the Falcon-C includes its reinforced MMCX connectors. They’re tighter than most but with even tension on either side. I haven’t experienced intermittency during my 6 months of testing. Hi Ryan, my IT01s just broke and I’m looking for a replacement. I loved the isolation of the IT01s and note the Falcon C’s can’t compete I this area. I’m looking at the Comets but I’m wondering if there are any other great isolators I should consider? Out of curiosity, what tips are you using on the Falcon-C? They don’t isolate quite as much as the IT01, but I found the stock tips to isolate especially poorly. The Comets are very strong isolators, they are fully sealed despite having a vented driver, especially with foam tips. The Symphonium Aurora has fairly strong isolation too, and its tuning is very nice. It’s fully sealed as well, but as it has a shallower fit than the Comet, it isn’t quite as isolating. You can also look into the Meeaudio Pinnacle P1, that earphone isolates very well. Hey Ryan, how do the Dunn Falcon-C compare to the likes of the Yamaha’s EPH-100 and the RHA MA750s? I had both, loved the Yamaha’s and am looking to upgrade. Thanks! Sorry Patrick, I haven’t actually had a chance to hear the Yamaha’s so I can’t provide comparison. Can’t say I’m especially attuned with RHA either as their distributor pulled out of Australia. Damn you Ryan! I was just about to order a pair of iBasso IT01s… then I read this review. I could ask you if they are worth twice the price of the IT01, but I think I already know your answer. The IT01 is a fine earphone, but I would still recommend the Falcon-C even at its higher price. It is more balanced and more detailed, it will tide you over longer before the next upgrade haha!